We have several corporate awards categories including app awards categories, live event awards categories, video awards categories, website awards categories, corporate literature awards categories, PR awards categories, and marketing awards categories, among others that may be of interest to communications professionals. 2. Review past winner's entries. 2012 ABA Gold winners include Bloomberg Law, Carlisle & Gallagher Consulting Group, Fazoli's Italian Restaurants, Ford Motor Company, HubSpot, iolo technologies, Northwestern Mutual, SquareTrade, and Vemma Nutrition Company, among others. 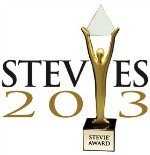 You can see the complete list of 2012 Gold, Silver and Bronze Stevie® Award winners here. 3. Pick who you would like to recognize and what for. There are hundreds of categories to choose from as well as awards for individuals, teams, and departments. Click here to see the entire list of categories. We want to help you highlight your organization's achievements. Contact us at help@stevieawards.com and we'll help direct you to categories that are right for your organization. How will your highlight your organization in the 2013 ABAs? The entry deadline for The 2012 International Business Awards, the world's premier business awards competition is 16 May. All individuals and organizations worldwide may submit nominations to The International Business Awards. If you haven't already done so, you can request your entry kit here. 1. Review our communications awards. There are a number of other IBA categories that should be of interest to advertising professionals, including many of the annual report awards and other literature categories, website awards categories, app awards categories, video awards categories, and live event awards categories. 2. Pick who you would like to recognize and what for. 3. Read 2011 IBA winning entries. The 8th Annual International Business Awards were presented in October 2011 in Abu Dhabi, the United Arab Emirates. You can read 2011 winning entries here. We want to help you highlight your organization's achievements. Contact us at help@stevieawards.com and we'll help direct you to advertising award categories that are right for your organization. Our 2011 ABA winners in the above categories include IDEXX Laboratories, CME Group, XPLANE, Sun Life Financial Inc., Wellesley Hills, MA: One of the Best Kept Secrets of World War II, and Dawson + Murray + Teague Communications, among others. See all 2011 ABA winners here. How will your highlight your organization in the 2012 ABAs? If you wish to submit your publication offline for review by the judges, you must first submit your entry online. Then, print out a copy of your entry and mail it with one (1) copy of the publication or series of publications to: The Stevie Awards, 10560 Main Street, Suite 215, Fairfax, VA 22030. Which type of business-related literature will you be submitting on behalf of your organization?